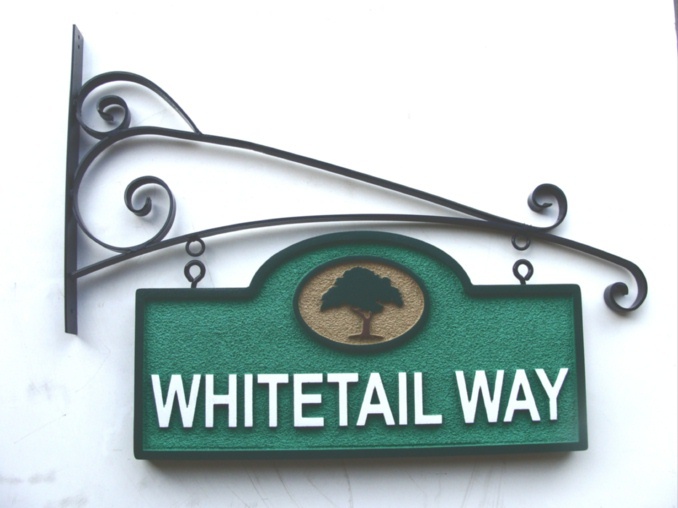 This sandblasted HDU street sign with an oak tree raised logo (also available in wood) has a very graceful wrought iron scroll bar, made in-house. Our street and traffic signs can be mounted on our round aluminum posts in several ways, as shown here. This section of Gallery 17 shows custom street name signs and posts. Our street name signs are made of HDPE (high Density Polyethelene, including ColorCore@; High Density Urethane (30 lb/ft3), or wood (typically Redwood). These are all carved, either with raised text and borders or engraved text. Simple art and logos can also be added. We also make custom aluminum street signs, iron sign frames, sign holders, aluminum and iron signposts, bases and finials. There are over 100 street, traffic and parking signs in this Gallery 17, and over 7000 different custom sign and plaque designs displayed in 45 indexed and organized photo galleries on this site. To see sandblasted or engraved 2.5D, or premium carved 3D High-Density-Urethane (HDU) and wood signs and plaques for street name signs, ,traffic signs, and parking/no parking signs, please click on Gallery 17 - Street Name, Traffic, Children Playing, & Parking Signs. We can make a sandblasted or carved/engraved wooden or HDU or HDPE sign or plaque of any design in any size from 12 inches to 60 inches. These can be placed on iron or wood posts, a wall , hung from a scroll bracket on a post. or mounted in a monument base. We can customize these signs with any shape, border, font style, or color scheme with carved (engraved) or raised text and art of your choice. For more information on design options, prices, and delivery schedules, please call us at (951) 698-8484 or email us at info@artsignworks.com and our customer relations staff will be pleased to help you and answer your questions. Please click on one of the numbered gray boxes on the lower left margin of this page to see other Photo Galleries, or use the navigation dark gray tabs at the top, or the gray boxes on the upper left margin to see other information. Please click on Home to see our home page. You can search for a specific sign type on this website by typing in key words in the Google Search bar at the top of this page. Return to the Gallery 17 (street & traffic signs) page by clicking on "Return to List" below right.